My goal in life is to make a difference and to help people. Rider helped me get started. During his college search, Ben looked for three things: a criminal justice program, the opportunity to participate in an Army ROTC (Reserve Officer Training Corps) program, and a small-to-medium size school. "Rider matched everything that I was looking for," says Ben. "ROTC was a priority for me. And I knew I didn't want to be in a classroom with 500 students. I wanted a college where I could build relationships with professors and network. "As soon as I stepped on campus, I knew Rider was the university for me," he adds. Ben came to Rider as a criminal justice major, but quickly realized he wanted the added challenge of a heavier academic work load in addition to his ROTC requirements. He added a second major in political science and a minor in homeland security while also spending hundreds of hours in military science classes and physical and tactical training sessions with Princeton University's Tiger Battalion, located just minutes from campus. In addition to four Rider students, the battalion included cadets from Princeton, The College of New Jersey and Rowan University. "My professors were so helpful," he says. "I have to admit it was really hard. I was taking up to 24 credits a semester, plus summer classes, but with their help I was able to finish a semester early - and with two majors." Ben's professors also encouraged him to apply to Rider's new graduate program in homeland security, which launched in 2016. He was accepted into the program during his sophomore year and began taking graduate level classes as a junior. Ben graduated with a double major in December 2017 and was commissioned as an Army second lieutenant in May 2018. Because he'd already completed many of his graduate courses while still an undergraduate, he's on track to finish his master's degree by Fall 2018. As an Army officer, he'll spend five and a half months training at Fort Leonard Wood in Missouri, then be assigned a unit in the military police in Catonsville, Maryland. "Rider allowed me to achieve everything I wanted. All my studies are related to what I want to do," says Ben, who plans to pursue a dual career in the military and law enforcement and eventually politics. "Rider helped pave the way to my future and my career." Ben graduated with a double major in criminal justice and political science, plus a minor in homeland security. He will complete an MA in Homeland Security in Fall 2018. "At Rider, no one ever told me no. My professors supported me and encouraged me, which enabled me to finish a semester early and earn more than one degree," he says. At Rider, Ben learned valuable skills through the University's nationally ranked Leadership Development Program. He helped found the Criminal Justice Club and participated in a half dozen club and intramural sports teams. During his senior year, he worked as a graduate assistant for the Criminal Justice Department and used social media to promote the club and build awareness of job and networking opportunities. As a Rider student, Ben spent 15-20 hours a week in military science classes and training with other Army ROTC cadets with the Princeton University Tiger Battalion. During his senior year, he served as Battalion S1 Personnel Officer. The position also earned him internship credit with the Homeland Security graduate program. "It was a great learning experience," says Ben. "I was in charge of human resources, accountability and logistics." 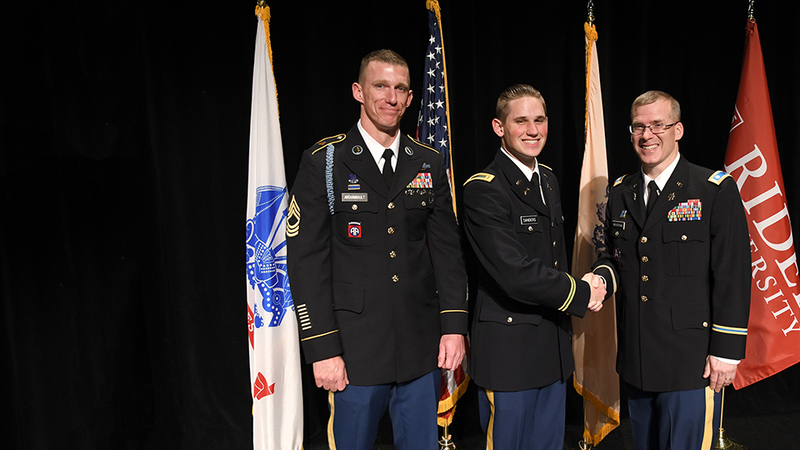 In May 2018, Ben was commissioned as second lieutenant in the U.S. Army. College is just one piece of the puzzle. I have more to accomplish and bigger goals ahead, but I'll always look back and know what I achieve in the future is due to what happened at Rider.